The word arabesque is used to describe a design which has flowing repeated geometric forms and patterns that combine in a fanciful way. The designs often having low relief curlicues. Often the design is very elaborate and consists of intertwined branches, leaves or flower patterns. 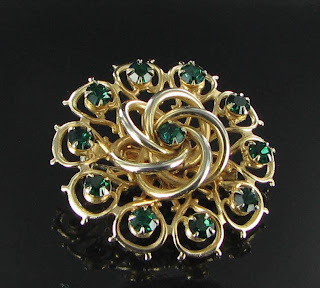 The main characteristic is the flowing style or intertwining of the elements of the motif. The technique originates from Baghdad in the 10th century. It was very popular in the Muslim world in both architecture and other design mediums. The technique was used not only on jewelry, but also on jewelry boxes itself. The final result is a piece which is both romantic and feminine with a filigree appeal and look to it. The style is also very popular as etching on lockets. 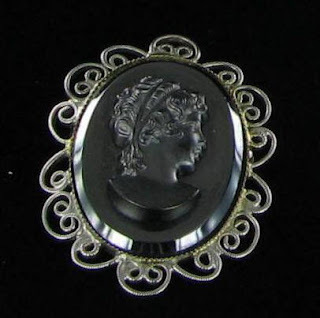 Cameos are also styles of jewelry which are set in Arabesque frames. Is the necklace in the last photo a design by Emmons? I ask because I have this same necklace and it is marked Emmons on the back (not just the clasp). 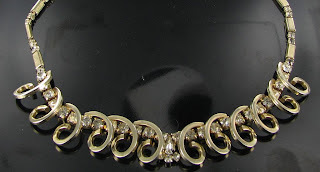 I'm aware that Emmons designed matching parures and/or Demi parures and so I've been looking for earrings by Emmons that were perhaps part of the set with this necklace. Lovely piece! And I love your blog! Thank you for sharing your knowledge and expertise.